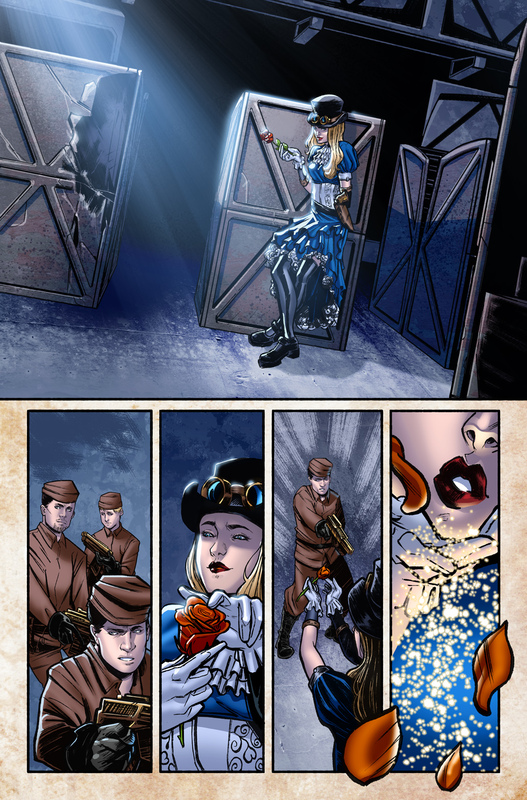 In an alternate Steam Punk reality, Robyn Hood, Alice Liddle, Cinderella, Van Helsing, Nathan Cross, and many other of the most popular Grimm Universe characters live in a stunning but dangerous world unlike any you’ve seen before. When a group of outlaws led by the infamous Robyn Locksley pulls off a major heist, her and her crew are hunted down by Shang, the local Sheriff, a mysterious assassin, and an extremely dangerous gangster who runs the town named Snow White. 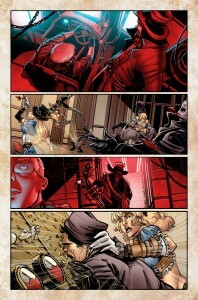 Pat Shand (writer) is joined by Annapaolo Martello (artist) and Robert Bevard (colorist) on interiors to bring this amazing new reality to life; with cover appearances by Sean Chen, Richard Ortiz, Mike Krome, and Renato Rei. Robyn Hood, the one-eyed heroine featured in her own series, leads a ragtag band of ne’er-do-wells on a mission of theft and mayhem. Her partners in crime are the Aether addicted and slightly mad Alice, and the temperamentally challenged mute Cinderella. The trio stage a hit on an airship, captained by Nathan Cross, targeting him for the priceless cargo he carries. Aether is more valuable than gold, used to power many of the clockwork machines that keep civilization rolling along. What’s more, there are certain mystical and… cough… medicinal properties that make Aether the most coveted substance known to man. Unknown to Captain Cross, he was carrying enough to run a major city for two years, the cargo’s nature kept secret in the hope that it would slip by any pirates unnoticed. 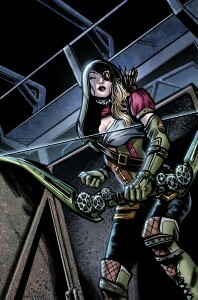 Enter Robyn Hood and her band of merry thieves… But don’t think for a second that they’re unopposed. 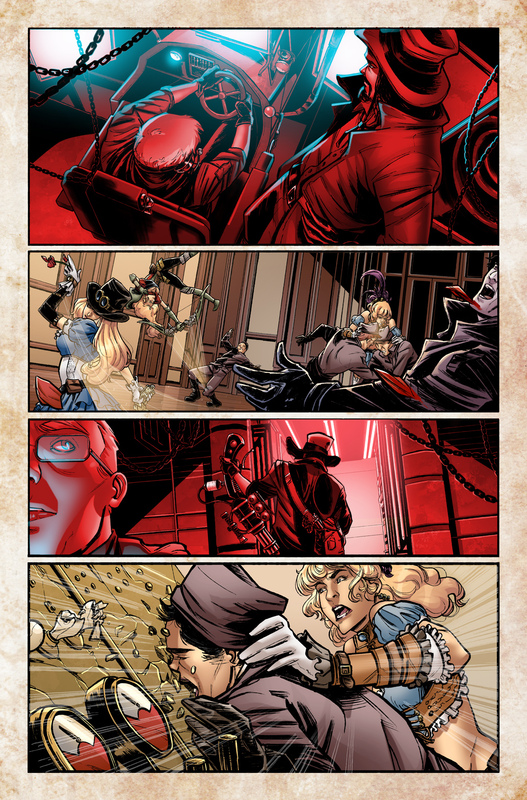 Determined to bring them to justice are Sheriff Shang Kisakawa of the Sun District, Liesel Van Helsin, Red Riding Hood, and a very determined Captain Cross. I haven’t really kept up with most of Zenescope’s titles… Aside from some pretty nice cover art (from the likes of Michael Turner and J. Scott Campbell), they just haven’t held my attention. 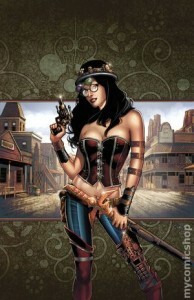 Steampunk, however, could be the one to change that trend. The artwork is pretty sharp, the classic characters given interesting and very unique looks to fit into the steampunk genre. What really sets this title apart is some pretty good writing. The dialogue flows very well, and has no shortage of wry wit. If I had one criticism, it would be in some of the page layouts… particularly in regards to action sequences. Some of the action could have benefitted greatly from larger layouts, maybe a splash page or two, but instead was squished down into small panels that made the movements hard to follow. 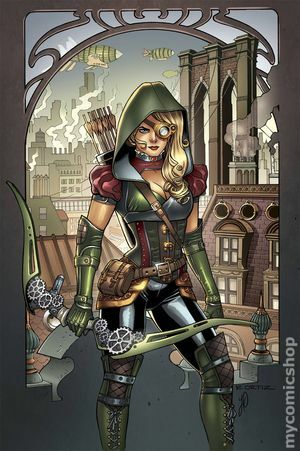 Still, Grimm Fairy Tales Steampunk is, if nothing else, an interesting spin on old stories, with no shortage of favorite old characters given new tales to tell. Take a chance. To paraphrase, you’ll miss out on all of the cool comics you never read.